New Mexico is also known as the Land of Enchantment, so it's no wonder so many couples flock to the state's largest city, Albuquerque, for a romantic getaway. Offering plenty of unique experiences, activities, and adventures, the city makes the perfect destination for newlyweds and long-married couples alike. 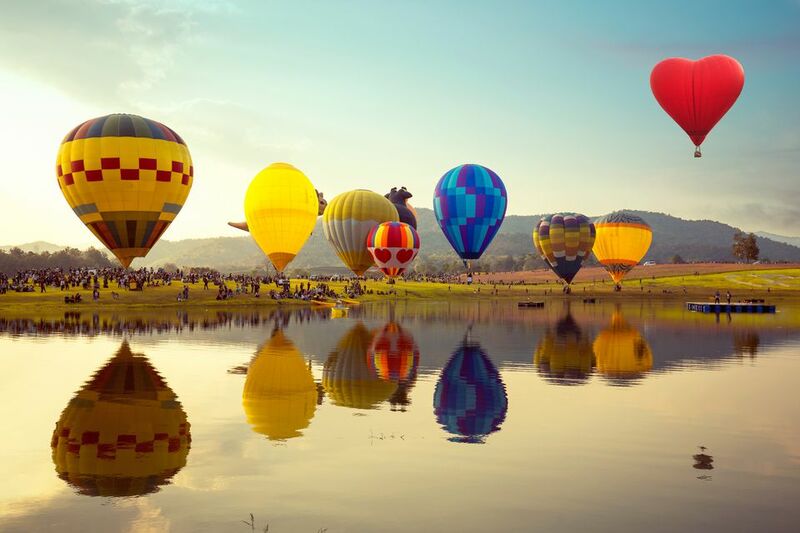 From hot air ballooning over the Rio Grande to venturing to the top of Sandia Peak, from wandering through the Petroglyph National Monument to horseback riding at Tamaya Regency Hyatt, the city of Albuquerque and the surrounding area is home to some of the southwest's most romantic attractions. What makes Albuquerque great is that the weather is nice enough for outdoor activities almost year-round, even in the middle of winter—though it may get a little too hot in the height of summer. Also, the city experiences relatively fewer crowds at many attractions in the spring and fall when schools are in session, which makes both seasons great for a quick weekend getaway. Whether you and your honey like active pursuits, cultural ones, or a combination of the two, the following attractions are great romantic additions to any visit to Albuquerque. Excluding the occasional roar of a propane burner, there is nothing more serene than taking in the town from above by balloon. Home to the annual Albuquerque International Balloon Fiesta each October, the area is renown for its excellent precision flying conditions. If you plan to catch a hot air balloon ride, get ready for an early day because the adventure kicks off at sunrise. Pack a romantic meal or pop the question as you float dreamily over the Rio Grande, soak in views of the Sandia Mountains, or peep into the backyards of Albuquerque locals. The morning concludes with a light breakfast and champagne toast, by which time you’ll already be drunk on love. Just 52 miles north of Albuquerque, you can take a breathtaking walk in the wild with your loved one on the stunning trails of Kasha-Katuwe (“white cliffs” in the Keresan language of the Pueblo de Cochiti), which reveal the unique majesty of structures more than six million years old. Formed by ancient volcanic eruptions, the conical rocks and towering striated walls provide nooks for picnics and gorgeous backdrops for photos. Here, you can savor a landscape of desert marigold as red-tailed hawks soar by, but be sure to bring everything you need including water to walk the easy Cave Loop or moderate Canyon Trail. However, camping, fires, and cooking are prohibited, so you'll need to bring pre-made meals and find accommodations elsewhere if you plan to stay the night. Hispanic heritage is a cornerstone of the cultural landscape of Albuquerque, and you can witness the vibrant performing and fine arts of the Hispanic community at the National Hispanic Cultural Center. If you crave an elegant evening out, you should purchase tickets to one of the center's special programs, which range from film to flamenco and opera to orchestra and take place in the Center’s beautiful Albuquerque Journal Theatre. During the fall and winter, you can also attend free dance classes and parties in styles that include Mambo, Aztec, and Latin hip-hop. Additionally, art lovers can wander the Art Museum, an impressively curated collection of forward-thinking Hispanic artists. Scale a mountain without taking a step at the Sandia Peak Tramway, the world’s longest continuous cable aerial tramway, which climbs 4,000 feet in roughly 15 minutes. The spacious cars can get packed with people, so make sure to nab an unobstructed view by the window to catch the impressive mountain vistas. At the summit, couples can cuddle as they watch the sunset dip below the horizon, and during ski seasons, intermediate and advanced snow bunnies can tote their ski gear and whoosh down the east side mountain runs. You can take in the outdoors on horseback in uncultivated Santa Ana Pueblo backcountry, where you'll ride through the bosky forests, mountain silhouettes, and high desert foliage of this pristine land attached to the Hyatt Regency at Tamaya. You should dress simply for your adventure; long pants and closed toe shoes are recommended. Aside from kicking up some dust, the journey can take rough riders into the Rio Grande itself, leading to occasional splashes. Hold your honey tight and get ready for a wild ride through the desert landscape of New Mexico, where you'll pass centuries-old Spanish homes, Pueblo ruins, extinct volcanoes, sweeping vistas, and wildlife including rattlesnakes, horses, and jackrabbits all from the bumpy seats of an off-road jeep. Keep the top up or bring it down, allowing as much exposure to the elements as you crave (bring a hat and sunscreen if you opt for open-air sightseeing). The itinerary can be flexible, making ample room for a hiking and other stops, all led by an experienced guide. This quirky site has 22 rooms of kitschy art and collections of ​curious, a perfect stop for an afternoon of Americana and folksy fun. Forty years in the making, Tinkertown was the work of Ross Ward, who created elaborate, kinetic tableaus with miniature hand-carved figurines. Housed in glass-bottle walls and home to fortune teller booths and vintage strength-testing machines, this off-beat attraction at times evokes an avant-garde art exhibit or carefully cluttered antique shop. Roughly 25 miles outside of Albuquerque, it lies on Central New Mexico’s Turquoise Trail National Scenic Byway. George W. Bush loves this Albuquerque haven for New Mexican cuisine, going as far as having them cater Cinco de Mayo festivities at The White House when he was in office. With an expansive menu of chile-infused New Mexican delights, El Pinto is the best for local cuisine in a romantic setting. Despite the sprawling property, the restaurant manages to create intimate corners throughout its dining rooms and festive outdoor patio, making it ideal for a special evening. Sample the salsa they make in the factory out back and make sure to sink your teeth into the succulent red chile ribs. Art fiends, tchotchke fans, and gem connoisseurs will enjoy a stroll through the adobe-architecture of historic Old Town. A community center since 1706, the tiny, winding streets bustle with souvenir shops, art galleries, and Native American artifact stores where you can easily find a chile-shaped oven mitt or turquoise necklace for the one that you love. Should you need a break from your adventures, several sightseeing attractions including the Albuquerque Aquarium, Rio Grande Botanic Garden, and the Rattlesnake Museum (with live snakes) are within walking distance of Old Town’s center. Wander hand in hand through the mysterious graffiti of yesteryear and see animals, people, and symbols carved into volcanic rocks 400 to 2000 years ago at the Petroglyph National Monument. Roughly 20,000 images decorate the trails of the Petroglyph National Monument, all believed to be carved by the ancestors of today’s Pueblo Indians. Walks range from easy to strenuous, leading past volcanoes, sand dunes, and archeological sites. Keep your eyes peeled for the rattlesnakes and coyotes who populate the area and bring plenty of water for your stroll.